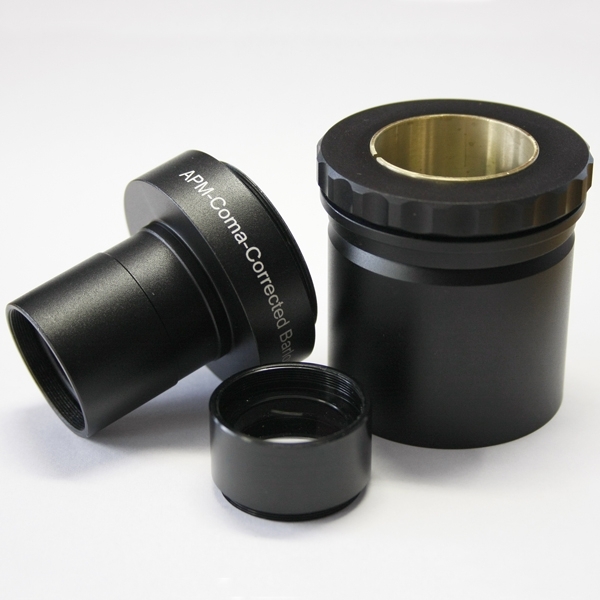 Due Forum discussions pushed, Gerd Düring in Germany designed this new, improved coma correcting ED Barlowlens, optimized for parabolic mirrors with f-ratio f/4. The 2-part adapter is photo-visual optimized, visual with the optimal backfocus of 105 mm with the new APM-Deluxe Centering Brass-Clamp. This top Deluxe adapter has a length of 55 mm and can be unscrewed, than you get a photographic T2 thread (M42 x 0.75 mm) for use with DSLR with T2 adapter ring. First results with the ED-Barlow has been amazing! Connection to eyepiece: 1 1/4"
Connection to telescope: 1 1/4" and 2"